ISACA has released their latest book on cloud computing : Security Considerations for Cloud Computing, earlier in the week I received notification that my personal copy is with FedEx on it’s way to South Africa for me, one of the perks of being an expert reviewer on the panel for the publication. 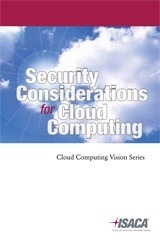 This guide is Another publication in the Cloud Computing Vision Series, Security Considerations for Cloud Computing presents practical guidance to facilitate the decision process for IT and business professionals concerning the decision to move to the cloud. It helps enable effective analysis and measurement of risk through use of decision trees and checklists outlining the security factors to be considered when evaluating the cloud as a potential solution. There are five essential characteristics, three types of service models and four major deployment models taken into account relative to cloud computing. To ensure a common understanding of these models, this publication describes the characteristics of each characteristic and model. This guide is meant for all current and potential cloud users who need to ensure protection of information assets moving to the cloud. If you are making any significant use of Cloud Computing I would recommend you get your hands on the publication. It’s free for members to download, otherwise $35 for a hard copy, $70 for non-members.